Chapter 1: What is omni-channel marketing? Inspiration and best practices to help you engage your users, no matter how or when they want to connect. Let’s set the scene: You know how dating shows sometimes whisk contestants away to a tropical destination? Maybe this time you're watching (it's your guilty pleasure, no shame) and it's St. Thomas. White sand. Blue water. Looks really good. So you check your favorite travel site to see what’s available. Interesting options, but you’re not ready to book. While looking at Instagram on your phone you see a targeted ad for the company’s app. You download, browse a little more in the app, and see a deal on a hotel in St. Thomas. You save it for later. About 8 days later, you get an email from the company about discounted room rates. By this time you’re just about fed up with winter and that email couldn’t have come at a better time. You use your work laptop to go back into the site, find the saved hotel ready to go, and book your stay. It took a few weeks, a couple of different screens, and multiple channels. That’s exactly what omni-channel marketing looks like today. Omni-channel marketing is engaging with consumers across all of the different channels they frequent. There's been a shift in marketing, and the linear conversion process is gone. It’s the natural progression of this shift: your users call the shots when it comes to how and where they want to engage with your brand, and it’s your job to keep up. We know targeted emails, remarketing campaigns, and geo-push notifications work well because they give users an experience that’s relevant to them: the actions they’ve taken, what they’re interested in. And they want to be able to have a consistent experience every time, on every device. That’s what omni-channel does. You create an aligned experience for your users across every user touch-point. Omni-channel marketing provides a continuous user experience across all channels customers use to access your brand: from your apps and website, to ads and real-world touch-points like your in-store experience. The idea is that we know users frequently hop between channels while interacting with a brand, and we can better serve them by letting them pick up where they left off. From a data standpoint, that means items in their carts are saved. From a content standpoint, messaging is consistent, complementary, and uninterrupted across channels. And while we’ll admit that we’re especially interested in how omni-channel works on mobile, it’s just one (critical!) part of your user’s overall experience. Step 1: Get everyone on board. No one person--heck, no one team--can create an omni-channel strategy on their own. You need to get a whole bunch of marketing teams on your side: digital ads, email marketing, social media, the website, loyalty programs, mobile...the list goes on. And we’re not just talking about your CMO. Since a powerful omni-channel marketing strategy ideally includes a complete ecosystem of touchpoints, you’re going to need to enlist the heads of sales and customer engagement/support, too. But let’s say that first on your list is the leader of your organization: your CMO. How do you sell an omni-channel strategy to your company’s head marketer? Use the stats we’ve listed in the first chapter. Nothing convinces a marketer faster than hard data. And that’s important, because executive support will be critical to getting other marketing teams on board. So now you’ve sold your CMO on how omni-channel is going to transform how your company does marketing. Be sure to use the data to get the other marketing/product teams on board, too. Exec support will ensure people come to your meetings, but genuine excitement and buy-in makes all the difference. Involve the teams you’re working with from the get-go. No one understands a particular channel space more than the people living and breathing it every day. To create a strategy that works, you want the people who understand the user patterns and team goals in the room. You have a much better chance of creating an effective workflow. Get aligned with each team's timelines and what they need to create the right experience, and your process will be smoother from the get-go. You avoid making strategic decisions that could impede what’s already working for a channel. It’s much harder for people outside the space to anticipate something that could hurt what’s already working for a channel. Step 2: Map your user journey. What steps do users take before they become your ideal user; the kind that offers your business the greatest lifetime value (LTV)? Where do you interact with your users? Sit down. Take a breath. And list every different way you interact with users (and potential users). Look at each channel, and think about how you interact with users there. Where do they fall in your funnel? User journeys are complex, especially in an omni-channel world. You have to know who your user is, you have to understand their context, and how their goals and behaviors may differ by channel. Understanding whether the user is new, a loyal customer, and where they are in their buyer journey leads you to the next critical question: How do users interact with each channel depending on where they are in the funnel? If your app is downloaded by your most loyal customers, you’ll want to interact with them differently than a new user who just discovered your brand--maybe they’re signing up for email. It’s the kind of targeting already proven to boost your marketing, and is key to omni-channel. Because omni-channel marketing strives to give your users the individualized experience they want and expect, segmentation plays a critical role. Start by asking yourself what behaviors different types of users have in common. What does the conversion funnel look like for first-time customers? What does the conversion funnel look like for loyal, repeat customers? For example, a loyal customer may receive a promotional email and go directly to your app and convert. A new customer may have a completely different buyer journey, with more steps and brand interactions. Mapping out a few customer journeys will help you to begin engaging with users in a more meaningful way based on where they are in the lifecycle. PRO TIP | If there’s any gaps in your data, use A/B testing to get a better sense of what works for users according to channel. If someone abandons their cart in your app, does a message about returning and checking out their items get a better response via an email or a push notification? By mapping out your customer journey, you can better understand what your user expects from you, and how to create the kind of marketing experience that helps them become your ideal user: the kind that creates the most value for your brand. A brand that feels familiar, across every channel and device. Consistent branding is important because it helps create a sense of connection between your users and you. At its best, it creates a sense of familiarity that in turn creates more loyal users. If a customer is accessing your business through multiple experiences but the difference between them is jarring, you’re creating confusion--and distrust--that could keep users from engaging again. Maintain your message: product and brand positioning. Who you are, what you do for your users, what sets you apart from your competitors--you might say it differently depending on the channel, but your fundamental story should never change. Colors, logos, visual style. Visual cues are one of the strongest tools you have to remind users that they’re in the right place, with a brand they can trust. Voice and tone. The voice and persona you’ve created in one space--say, you’re website--should be recognizable on your social media and support properties, too. The best way to do it? Clear, detailed, and accessible brand guidelines. No matter how or where your users interact with you, brand consistency is reassuring and reminds them that they’re in the right place, with a brand they trust. One of the most obvious examples is Apple, of course. From their stores, to their site, to every piece of software and hardware Apple creates: they all maintain certain design elements, while being optimized for the audience and the purpose they were created for. Minimalistic, streamlined design and a matter-of-fact yet friendly tone are present in all of them. A clean, simple UI on the web and mobile app is crucial for users to orient themselves, and establishes your credibility. Make sure the content is complementary across all your channels, too. Button placement, headline alignment--keep them as consistent as possible across all experiences. It’s reassuring to your user to be able to correctly predict where they’ll find what they need. Tidal has a mobile-first design that seamlessly extends to their desktop experience. The modular design, left-hand menu that extends out, right-hand search bar and control bar across the bottom of the screen are present no matter what device a user is using to play their latest favorite song. Slack deserves a shout out as well. You can customize your sidebar for any Slack team you join, and no matter how you log in--desktop, web, or mobile--your custom theme and recent conversations will be ready for you to pick up right where you left off. Context optimization. Consistency doesn’t mean you don’t adjust user experience according to device (context). Think about what your user’s priorities are based on the device they’re using. Starbucks’ website emphasizes joining their rewards program, and seasonal announcements; while the app prioritizes ordering and streamlines the process of adding money to their card. When it comes to omnichannel marketing, your CRM is your best friend. Capturing customer data and recording your interactions with users over time is critical to understanding their relationship with your brand, and fine-tuning your messaging. That’s how you can ensure the right message is getting to the right user, at the right time. If a customer can buy, or register, or other interact with your brand across channels, they expect to be able to reach your support team on any channel, too. But it’s important that the support isn’t siloed. If you need to refer a customer to another channel, making them repeat their dilemma is a great way to increase their frustration. How do you do cross-channel customer service effectively? Having the information you need about a user lets you get to the problem faster. Make user data accessible to your team. Often, it’s not only a customer success manager who’s in touch with a customer while working through an issue. If you’re able to keep record data about customer outreach, make sure employees can easily access it when they need to. Amazon’s been perfecting this for years. Homepage content is tailored to your purchase and search history; and items in your cart appear whether you’re using the app, Amazon’s mobile site, or the desktop site. Every user has their own Amazon. Amazon’s Dash buttons are one of their more recent omni-channel innovations. Dash buttons pair with the Amazon app. Like any traditional Amazon purchase, confirmation communications, receipts, and tracking is managed through email in additional to the app. Dash buttons, for the repeat Amazon order. But bigger than Dash buttons is the influence of the Amazon Echo. Alexa is a virtual assistant who remembers your last Amazon order, and can pick up right where you left off in your Kindle, and read it out loud to you. The easy access to an exhaustive amount of user data lets the Echo and Google Home offer the kind of individualized experience that users clearly value: over 5.1 million Echos have been sold over the past 2 years. Amazon is creating app integrations on the B2B side, too. Hi, Alexa. We’re out of paper towels. The ease of easily re-ordering or referring back to products you’ve placed in your cart speaks to a key feature of a successful omni-channel strategy: carrying user carts across devices and channels. Tracking customer tracking customer data and offering a streamlined checkout process across access points is how you align with your users expectations: when they’re shopping, or looking for event tickets, or booking a hotel, they consider it a singular experience--no matter how many devices they use. Beacons are devices in brick-and-mortar stores that send targeted messages when an app user is detected nearby. Barney’s, the upscale department store, implemented them throughout their flagship store in New York City. Barneys uses the beacons to send personalized product recommendations to customers via their app, as well relevant editorial content and recommendations from Barney’s website. Beacons aren’t just a powerful tool for retail. In 2016, 86% of events were expected to utilize a mobile app. And considering location-aware apps see a 235% increase in engagement over other apps, that’s a good move. In 2016 the TriBeCa Film Festival used over 50 beacons to send targeted push notifications about upcoming showtimes, sell tickets, and events happening during the festival. By placing beacons by the exits of venues showing films, the festival could ask for feedback at the best possible time--when the film was still fresh in attendees’ minds. Brands may operate globally, but their customers are thinking locally. No marketing campaign will convert as well as when it’s targeted to the culture and taste of the customer. Language. 75% of customers prefer to make purchases in their native language. Apps available in a market’s native language saw a 128% increase in downloads. But for omni-channel, that means making as many of your customer touch points available in their native language as possible. So email marketing, support, digital creative--for a truly holistic, omni-channel experience, you’ll want to maintain language consistency. Looking to localize your app? For iOS, Apple has your guide right here. Android developers, Google has a guide for you too. Luxury brands traditionally don’t carry all the items and sizes customers may want. 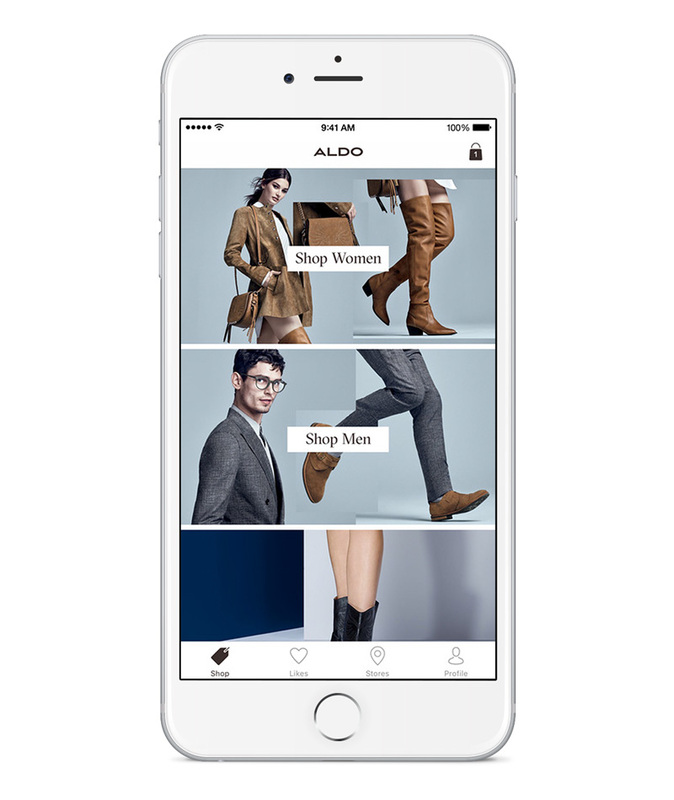 Aldo recently opened a new store designed to combine the in-store and mobile experience. Not only can customers use their app place an online order, right in the store, but the app provides content and recommendations based on the customer context: the customer’s purchase history, what they’ve abandoned, and the season. Customers get an experience that’s more tailored to them than any salesperson alone can provide. REI makes it easy for customer to access user reviews. User reviews and ratings are a powerful influence when a user is deciding whether or not to take action. Traditionally, users would check out items in person, and then head home to research and compare. REI took away the need for that step by letting users scan the barcodes on items and see user-generated ratings right in the app. This kind of peer review is a key step before buying for plenty of people, and REI gets a user to make a decision, faster, by making it happen in-store. REI makes it easier for users to access reviews in-store. CVS creates a new app + in-store experience. Here’s a common story: a user starts in your app or website, places an order, and heads to a brick and mortar store to pick up their purchase. At Target, this accounts for 15% of all orders placed on Target.com. That’s a sizeable group! CVS targeted this type of shopper with their recent CVS curbside pickup launch. CVS Health users place an order from the CVS app, or online. Then, they go about their day, until they get a text letting them know their order is ready to be picked up. Once they're outside, the app lets a CVS employee know they’ve arrived so their order can be brought out to them. CVS is working with Curbside to provide the service, and says their clients see an average of 30% increase in new customers, with 61% of customers making a repeat purchase. Omni-channel in action at CVS. It’s not just small screens you need to think about. Apps on smart TVs are still new territory for consumers--and brands outside entertainment--but more and more brands are starting to take advantage of what the channel has to offer. Airbnb’s Apple TV app will let you browse available rentals and book your next stay. For an app known for stunning photography and a user that’s prioritizing the images available, the channel makes perfect sense. It’s certainly more comfortable for a group of travelers to gather around a TV than a laptop, tablet, or phone. It’s a clever way for Airbnb to make using their service a fun, social experience for their users. With their 2016 Apple TV app, Burberry became the first luxury brand to livestream their runway show on the platform. The app also features highlights from past shows, performances at Burberry events, and other special content. The emphasis isn’t on fostering conversion via the app, but engaging and strengthening ties between Burberry customers, and increasing brand awareness. Plus, the kind of content Burberry’s creating for this channel can easily be repurposed and optimized for social media, blog posts, and more. The people joining your loyalty program are either already your most engaged customers and users, or they have the potential to be. The seamless, personalized qualities of omni-channel marketing make it a powerful piece of a loyalty program that drives repeat business and engagement. Make it mobile. Don’t limit your users to in-person experiences. Let them access rewards points, redeem coupons, and buy right from their device. Use beacons in-store to show users offers they can take advantage of. The connection you’ve already built with these users calls for a highly personalized experience on all these channels and user touchpoints, too. It doesn’t always work when a brand attempts to capitalize on an current event. But GrubHub saw massive engagement via a campaign around the Presidential Debate that took place this past election season, on September 26, 2016. The GrubHub team understood that this was a massive national event that would engage a large swath of users. Being a televised event, people would be home, probably with friends or family--all contributing to a perfect environment to order food. So they created two promo codes--IMWITHHER and IMWITHHIM-- and tracked the results, promoting them across their social media and email channels. What made it an omni-channel campaign is how well the campaign was synced across channels, with the experience adapted for email, social, app, and website. That’s an experience that started with a user’s account on the desktop site, mobile site, or app, and extended through GrubHub’s email and social media channels. Measuring and analyzing the results of omni-channel is a whole different ball game than analyzing the results of more traditional marketing campaigns. Customers aren’t interacting with you on just one channel--and the channels where users convert aren’t necessarily the channel they started on--so you have to figure out how to holistically measure what’s pretty much a user ecosystem. Good luck! Tell us how it goes, okay? Just kidding. We’ve come too far to leave you hanging now.To start, don’t evaluate the results of your strategy based on how a single metric performs in a single channel. Conversion may not be the right metric for every channel. It’s tough not to get caught up in conversion numbers. But let’s think about mobile: the stats we mentioned in the very first chapter showed that users frequently use mobile in the research portion of their customer journey, and buy elsewhere. So the conversion metric doesn’t tell you much about the critical role mobile’s playing in the user journey as an influential tool. What are the strengths and weaknesses of each channel? As we mentioned above, what do users depend on each channel for? From there, you can identify the right metrics. The Washington Post app may prioritize session per month and time spent in app, for example. Plus, in a news app, while subscription may be the obvious goal for media outlets, there’s other ways to measure actions that create value: revenue is generated along the way through page views on the mobile and desktop site, and social shares are valuable promotion for the brand, too. Actions like social shares can be considered valuable events that take place along the user’s path to the ultimate goal, which could be becoming a long-term subscriber. Ultimately, in an omni-channel world, it takes more than one touchpoint to build the kind of user relationship your business needs to grow. New customers don’t become brand fanatics through one touchpoint. It takes time to build loyalty and increase customer health. Identify metrics that indicate users are engaging with your brand--email open rates, page views, repeat visits to your product pages--rather than focusing on conversion in every channel. Starbucks is a bonafide success story in the omni-channel space. But the brand’s finding their runaway success does create new kinds of challenges. Despite reporting record revenue in the fourth quarter of 2016--$5.7 billion--Starbucks saw year over year same-store sales dip for the 5th quarter in a row. The reason? Starbucks says that the order-ahead via their app has become so popular that baristas are scrambling to fill those orders and serve walk-in customers quickly. Some of those customers leave rather than wait, leading to a dip in revenue. The point isn’t that Starbucks saw a dip in in-store revenue; the point is that once they adjust and reduce any new points of friction, they’ll see the benefits from both omni-channel and traditional customers. Just like any marketing strategy, your omni-channel marketing is never done. Consistent A/B testing across channels will serve a major role in refining your strategy. Where do discounts and coupons get the most engagement--your app, via email, or both? How does geofencing in your app impact in-store purchases? Use what you discover to shape your next campaign. Omni-channel is set to fulfill its promise as the buzzword of the year. In retail, industry leaders like Amazon and Walmart are building out a presence in as many channels as they can. Despite hastening the downfall of traditional brick-and-mortar chains like Barnes and Noble, Amazon is experimenting with stores in multiple major markets, with Amazon Books and drive-up grocery stores on the West Coast. But don’t think it’s a traditional store; mobile will play a major role in the customer’s experience in these stores, from using coupons to ordering groceries for pickup, and checking out via app. Meanwhile, Walmart’s following a similar strategy, but starting from a more traditional focus on big box stores. Their acquisiton of Jet.com is a clear sign that Walmart will be heavily focused on the digital space this year. Brands are even utilizing third party apps as part of their omni-channel marketing strategy. 570 million users log on to Chinese messaging app WeChat a day. Most of these users are in China, where brands have been utilizing them as a means of reaching those audiences for years (Buzzfeed started partnering with WeChat in 2014). More and more, we’re seeing brands like Sephora, Kate Spade, and Buzzfeed experimenting with ways to engage users and serve up specialized content in Kik, Facebook Messenger, and more. Sephora was one of the first brands to create a bot for Kik. It’s a little daunting, to be sure. And to be sure, omni-channel has been knocking around as a buzzword for years, without meeting marketing expectations. But as more and more users expect--demand, really--that brands create marketing that meets them in the spaces they’re using now. Individualize and streamline your experience as much as you can, and you’ll see results. Localytics gives brands the data, intelligence and marketing channels to deliver a meaningful, personal customer experience. We help brands discover and deliver exactly what their customers are passionate about, and integrate those insights and experiences across other channels to deliver a digital customer experience that resonates. Our platform is used in more than 37,000 apps on more than 2.7 billion devices by companies such as ESPN, Fox and The New York Times.